This is a FasTrack® Half Curved Track Section (O36 22-1/2 Degree) from Lionel®. FEATURES: This section equals half of a full O-36 curve section. This is a FasTrack® Half Straight Track Section from Lionel®. This is a FasTrack® Quarter Curved Track Section (O36 11-1/4 Degree) from Lionel®. FEATURES: This section equals 1/4 of a full O-36 curve section. This is a FasTrack® Uncoupling Track from Lionel®. 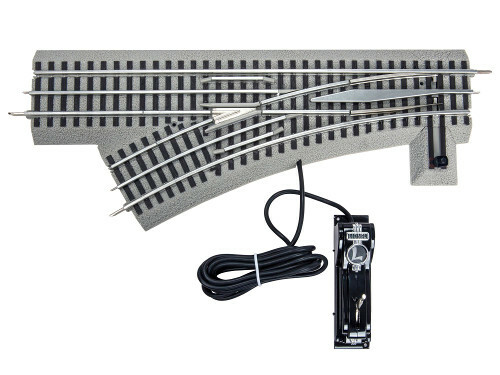 This is a FasTrack® Terminal Section from Lionel®. notice a reduction in power or your train slowing down. This is a FasTrack® O-36 Full Curve Track from Lionel®. This is a FasTrack® Straight Track Section from Lionel®. This is a FasTrack® 90° Crossover Section from Lionel®. This is a FasTrack® O36 Manual Switch (Right Hand) from Lionel®. FEATURES: This switch is controlled by rotating the switch stand. 10" straight with a 33-3/4 degree right hand turnout. Also includes a quarter curve section already attached. This is a FasTrack® O36 Manual Switch (Left Hand) from Lionel®. 10" straight with a 33-3/4 degree left hand turnout.